This fiery Red LED on a flexible ribbon strip is perfect for a place that you want to accentuate with color. They have a very wide viewing angle and use very little energy. These LED ribbon strips run on 12 volt DC current. Add an incredible accent to your restaurant, signage, commercial property or home. 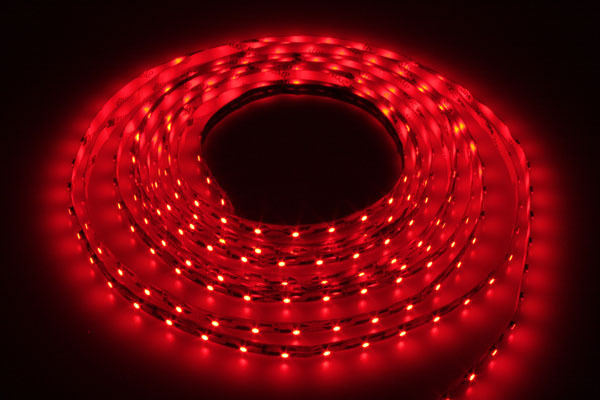 These Red Flexible LED ribbon strips are sold so that you can fully customize them. You can cut them to virtually any desired length within 2 inch increments. You can use solderless connectors to connect to power or to other pieces of LED flexible strips. If you want to protect them against moisture, you can use our mounting sleeve. LED dimmers are also available for controlling the brightness.